In a city planned out in a neat little grid, Passyunk Avenue cuts a diagonal through South Philly. The avenue has long been known for its culinary cachet in close proximity to the Italian Market– and of course tourists know it as ground zero in the great Pat’s vs. Geno’s cheesesteak war. But in recent years East Passyunk has enjoyed somewhat of a renaissance, as diverse restaurants and independent boutiques have moved in alongside the old, creating a neighborhood that is more vibrant than ever. The littlest residents of East Passyunk have three locations of Alphabet Academy right in their neighborhood, including the new Alphabet Treehouse (1506-08 E. Passyunk Ave.), an eco-friendly childcare facility whose academic curriculum includes “living green” activities, yoga, and more. The backyard has been transformed into a hands-on children’s garden, and the facility also includes a science lab with an adjacent “Green Roof” deck to explore. Photograph courtesy of Visit Philly. Leary described how Principal Andrew Lukov helps make Southwark great by being open to parental involvement, and also figuring out how to tap into resources throughout the city, and figure out how to bring them into the school. This summer, the Southwark community worked with the Mural Arts Program and other civic organizations to revitalize their schoolyard using recycled materials and artistic design. “It’s not just going to be a playground for the kids, but truly a space for the whole community to gather,” Leary tells us. The centerpiece of East Passyunk Avenue is the Singing Fountain (11th St. and Passyunk Ave.), which gets its name from the music that plays over speakers throughout the day. It’s a great place for residents of all ages to relax, grab a book from the Little Free Library, and gather with friends. In the summer, they host a farmers market on Wednesday evenings, where you can pick up fresh local produce and other goodies. Columbus Square Park, located at 1200 Wharton Street, is a wonderful neighborhood playground, as well as a dog park and garden. The playground is divided into equipment for bigger kids as well as a tot lot for little ones; and it also has a sprinkler for summertime! The rec center runs a preschool program, an after school program for grades K-5, and other classes. 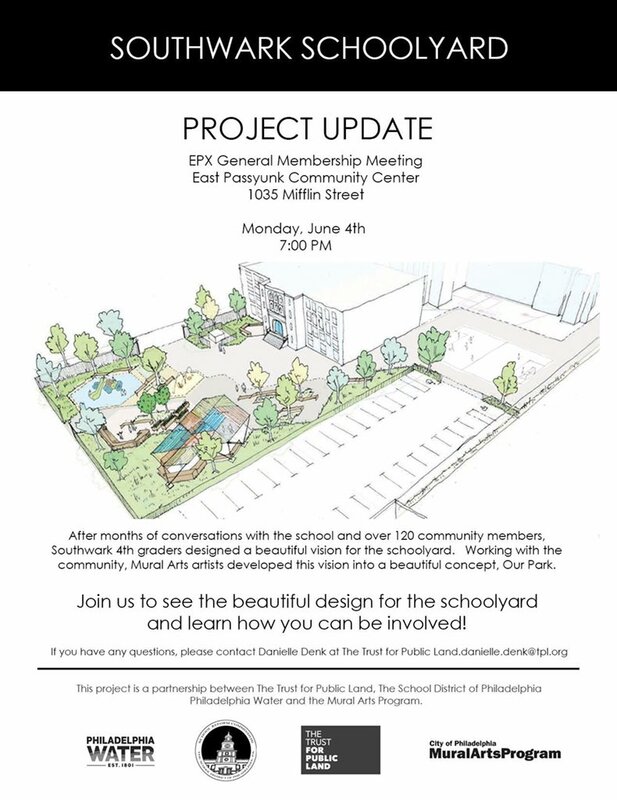 East Passyunk Community Center, at 1025 Mifflin Street, hosts programs including after school childrens’ activities, basketball leagues, summer camps, senior activities, and much more. They also host community events like holiday celebrations, free outdoor summer concerts, and movie nights. For mamas who want to get moving and bond with their babies at the same time, check out Wake Up Yoga (1839 E. Passyunk Ave.) for Baby and Me yoga classes. They also hold prenatal yoga classes if you’re still preparing for baby. East Passyunk is home to so many independent boutiques that sell unique goods and, in some cases, also serve as community gathering spots. Tildie’s Toy Box (1829 E. Passyunk Ave.), our 2018 Philadelphia Family LOVE Award winner for Best Toy Store, just celebrated its second birthday. In just two short years, it has established itself as one of the best places to shop for kids of all ages, with a wonderful assortment of books, pretend play, baby toys, dolls, puzzles, STEM exploration, and so much more. They even have a wall of buckets with little impulse items like fidget toys and temporary tattoos. If you have little kids in your family, you’ll probably find yourself here for weekly for Music Monkey Jungle classes (they’re on Monday mornings). You may have to chase them into the cozy little castle in the back to get them to leave! The Nesting House (1606 E. Passyunk Ave.) is a great place to build a baby registry (they have free consultation services), shop local and natural products like toys and baby carriers, and also to consign. You can drop off gently used close for consignment, and use the credits to buy more clothes for your kids! They also have a cloth diaper and babywearing support person to help you choose what works best for your baby, and you can try out the different carriers, including rentals. In addition to all these great items, The Nesting House also serves as a community gathering spot, with music classes and new parent meetups. Aside from these kid-specific shops, East Passyunk has so many interesting shops. One of our favorites is Occasionette (1825 E. Passyunk Ave.), a gift shop that’s great if you need to pick up a last-minute hostess gift, birthday card, or just want something cute for yourself. Flora and Fauna (1724 E. Passyunk Ave.), a relative newcomer to the Avenue, is something you will find nowhere else. There, you will find both beautiful floral arrangements and exotic plants for your home, but also reptiles and amphibians from ILLExotics! Even if you have no intention of adding a scaly pet to your family, this place is a must-visit with your kids! Photography courtesy of Visit Philly. Let’s get this out of the way: yes, Pat’s King of Steaks and Geno’s Steaks are both located here, in one glorious triangular intersection (9th St., Wharton St., and Passyunk Ave.) glowing with neon lights and smelling of fried onions. 24 hours a day, tourists (and locals) flow like Cheez Whiz. But East Passyunk is so much more than cheesesteaks—its varied and exciting food scene is what has really put it on the map, and made it a destination for those coming from all over the city. In a relatively small area, there are just too many great restaurants to name. But let’s go ahead and highlight some of our favorites! There’s a diversity of restaurants, from Mexican (Cantina Los Caballitos at 1651 E. Passyunk Ave. and Pistola’s Del Sur at 1934 E. Passyunk Ave.) to Malaysian (Saté Kampar at 1837 E. Passyunk Ave.). Our personal favorite spot is Bing Bing Dim Sum (1648 E. Passyunk Ave.), which is both trendy and kid-friendly at the same time. Kids will love the bright street art, and if they have a little trouble with chopsticks, Bing Bing has little plastic training tools for little ones. Here you’ll find a great happy hour alongside your kids’ (restaurant-issued) sippy cup, too. If that’s a little too spicy or adventurous for your picky kid, P’unk Burger (1823 E. Passyunk Ave.) is sure to please. Owners Marlo and Jason Dilks have six kids of their own, and opened their restaurant with families in mind. Kids can eat foods they really want—like burgers, fries, and shakes—but parents can feel good about the fact that their “Little P’unks” are eating food that is made thoughtfully with organic, locally sourced ingredients. One of the best kept secrets of East Passyunk is Mancuso’s Cheese Shop (1902 E. Passyunk Ave.). What’s the secret in this generations-old family cheese business? They have some of the best homemade water ice you’ll find in the city! If you’re looking for breakfast, our picks are Passyunk Avenue Philly Bagels (1742 E. Passyunk Ave.) for fresh bagels and toppings, and Chhaya Café (1819 E. Passyunk Ave.) for great coffee and brunch. Just off the avenue, The Tasty (1401 S. 12th St.) is serving up vegan diner comfort food. And for a quick, healthy lunch, Fuel (1917 E. Passyunk) has smoothies, salads, wraps, and more fresh favorites. Dessert options are also plentiful. Arctic Scoop (1812 E. Passyunk Ave.) is a new Asian style ice cream shop serving flavors like taro and pandan in coconut bowls and egg waffles, with Instagram-worthy toppings. Meanwhile, beloved gelateria Capogiro has a Passyunk outpost (1625 E. Passyunk Ave.), and Good Moo’d (1647 E. Passyunk Ave.) serves up trendy rolled ice cream. Aside from ice cream, you can also find Jewish bakery Essen (1437 E. Passyunk Ave.), where you can find classics like babka and rugelach. Of course, if you secure yourself a babysitter, East Passyunk is also a great date night location, with top restaurants like Will, Fond, Townsend, and Laurel. At the end of July every summer, East Passyunk hosts an annual Car Show and Street Festival. This show features over 175 muscle, classic, antique, custom, and show cars, trucks and motorcycles, as well as street vendors, rack sales, kids’ activities, live music, and a craft fair. This is a summer tradition that brings people from all over not just South Philly, but the entire Delaware Valley, down to East Passyunk Avenue. In the fall, East Passyunk hosts Fall Fest and Spooky Saturday, a Halloween festival with costume contests, free pumpkin decorating, trick-or-treating, a scarecrow scavenger hunt, and more. The event also features craft vendors, live music, and food from local restaurants. During the holidays, be sure to visit for Deck the Avenue, a month of shopping events, live performances (including carolers and Mummers, of course), treats, storytimes and crafts for the kids, photos with Santa, a tree lighting, and so much more. East Passyunk has so many amazing restaurants, it is no surprise that they have their very own Restaurant Week. This takes place during February, and features three-course prix fixe lunch and dinner menus for $15, $25 or $35. Photograph courtesy of East Passyunk Avenue Business Improvement District. And when spring returns, come down for a massive Easter egg hunt! Spring also brings Flavors on the Avenue, one of the city’s best street fairs featuring five blocks of street food, seasonal sips, craft beer, live music, sidewalk sales, and free family fun. Over two dozen of the region’s best restaurants come out offering pay-as-you-go small plates specially priced between $3-$6, so you can try a little of everything, and a family fun zone has activities going all day for the kids. And as spring slides into summer, the Avenue hosts an Italian National Day Festival, “La Festa,” with live music, outdoor food and drink, shopping, family fun, games and a spaghetti eating contest! East Passyunk is conveniently located in walking distance from both Center City and other South Philly neighborhoods. It is very close to Tasker-Morris Station on SEPTA’s Broad Street Line. There are also multiple SEPTA bus lines that cross East Passyunk Avenue at various intersections. Lead photo courtesy of East Passyunk Avenue Business Improvement District.